Even if hospital patients have always hated their food, whether it’s microwaved meals, over salted vegetables, or fresh fruit, there are still things we can learn from the past. 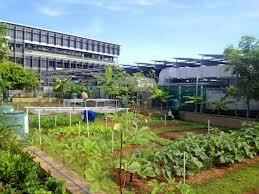 One obvious change in food provision is the loss of the hospital garden. Until the nineteenth century many hospitals had outdoor space, part of the therapy for recuperating patients, a place for Apothecaries to grow healing herbs, and a site for kitchen gardens to feed the staff and patients. Outdoor space was lost in the nineteenth century as giant hospitals were built in crowded urban areas, and as convalescent and elderly patients were moved to homes and hospices elsewhere. There’s quite a trend for ‘urban farming’ in the twenty first century – perhaps that could extend to give hospitals back their gardens too? The idea of a little herb garden where patients can convalesce in the sun amid the mint, rosemary and the butterflies they attract is obviously wonderful. The idea that anyone should be trying to grow bulk foods in an urban environment is simply ludicrous. For we've invented this thing called "transport" as well as "economy of scale". Hospitals are, as they note, in urban settings. Because that's where all the people are and it's sensible to treat people near where they live, near where their families live so they can visit them. Excellent: but that means that land is expensive where hospitals are because that's where all the people are. A few acres of urban land can be worth millions upon millions of pounds: using that to grow £50's worth of vegetables is simply not sensible. What is sensible to to use that agricultural land 50 miles away, worth perhaps £5,000 an acre, to grow the same vegetables and then splash a fiver or so per tonne of food on the petrol to transport them. We thus use fewer resources to get to the same goal, feeding the sick, and this is a process that makes us richer as a whole. It's also true that agriculture is subject to the most enormous economies of scale. We can tell this: food grown in those 50 acre monocrops is markedly cheaper than food used to be when we all had our little 15 acres of the country to cultivate. This is true even if we don't include the labour we used to perform "for free". The urban poor would spend 80% of their income on food and rent in centuries gone by. Today the average is 10-15% on food. The idea of feeding the sick from hospital gardens is simply bonkers: guess that's why it's being suggested in The Guardian.